Tom Holland & Benedict Cumberbatch Talk Filming "Infinity War"
Some people sing in the shower—and other people, like Tom Holland, take it a step further. Before Avengers: Infinity War hit theaters, E! 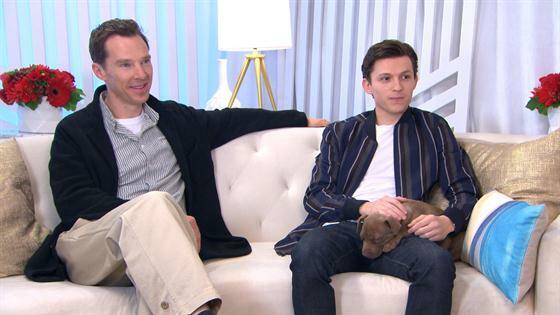 News' Sibley Scoles talked with Holland and Benedict Cumberbatch about their recent forays into the Marvel Cinematic Universe—and she also asked about the fate of their characters after the fourth Avengers film premieres next year. "To me, it's never unfinished business with Marvel. You never know if you're going to get a call back," said Cumberbatch, who made his debut in 2016's Doctor Strange and returns as the Sorcerer Supreme in the new movie. "As far as I'm concerned, I'm a small part in a much bigger narrative—a tiny tile in the massive mosaic of it all. When you finish your bit, you always think, 'For now.' Until you get the phone call saying, 'We need to pick it up. We need to re-shoot.'" Cumberbatch doesn't mind getting back into character, of course. "They don't stop improving," he told E! News. "That's the great thing about them." Both British actors play American superheroes, and as such, Holland said, "I always have to practice my American accent; I do it every day in the shower! I shower in American, just so I'm ready." Asked to demonstrate, he politely declined and said, "I can't do the showering, because that would be inappropriate!" But Cumberbatch decided to egg Holland on, joking, "Oh, go on!" Light teasing aside, Cumberbatch complimented Holland on his convincing American accent. "I can flip in and out of it, but I like to improvise a lot, so if I haven't done it in a while, I'll say things like, 'Oh, I'm at my flat.' You guys don't say flat; you say apartment," said Holland, back as Spider-Man. "I forget the words, so I have to practice—and I actually do do it in the shower." Said Cumberbatch, "There's no shame in that!" Apologetically, Holland said, "I couldn't possibly do my American shower justice in this setting." Watch the interview to learn more about Avengers: Infinity War, in theaters now.